Showing results for tags 'Princess Cadence'. must have seen shining walk into a wall again. 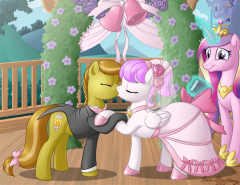 As many of you know, our Princess Manstream, one of the admins of this site, got married last week (and if you don't, go read and congratulate here.) This was my gift pic. I wanted it also in the gallery for tracking reasons. 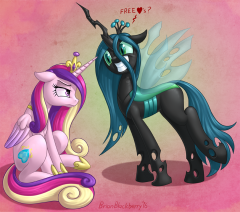 Figure to have Cadence marry them, because who better than the princess of luvs! © Art © Brianblacknerry 2012, all characters © their creators.